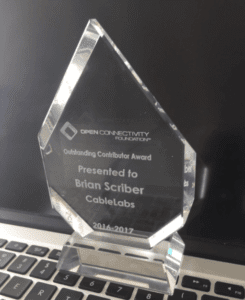 Congratulations CableLabs Technical Architect Brian Scriber for winning an Outstanding Contributor award from OCF. The award was created to recognize member companies and individuals whose outstanding contributions have advanced the Open Connectivity Foundation. According to OCF, Brian has been "instrumental in driving security requirements implemented in OCF 1.0 and driving the Security WG. He has been able to complete work on time, engage with other WGs across the organization, and stressing the importance of security in OCF." We couldn't be more proud! More information on the Outstanding Contributor Award can be found here. The industries and individuals involved in OCF believe that secure device connectivity is the foundational component to IoT. The Foundation develops specification standards, ensures secure interoperability for consumers, and provides a certification program for the Internet of Things (IoT) to communicate with one another regardless of operating system, service provider, transport technology or ecosystem. You can find more information on OCF and CableLabs here.